Remember that all verbs in Spanish either end in -ar, -er, or -ir? In lesson 1.4K, you learned about verbs that end in -ar, and in lesson 1.4L you learned about verbs that end in -er. In this lesson, you'll learn about verbs that end in -ir. 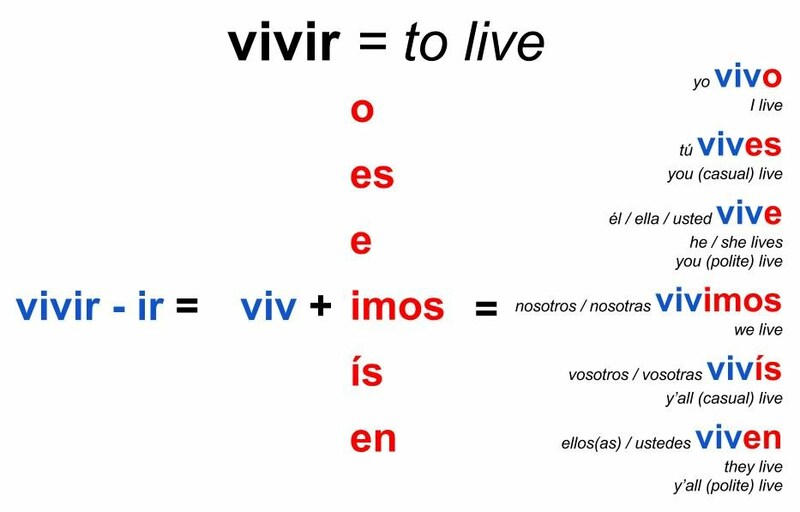 Two common verbs that end in -ir are vivir and escribir, which mean to live and write. Remember that to use verbs in Spanish, you usually take off the -ir (or -ar or -er) ending, and replace it with a special ending to indicate who's doing the action. This is called conjugating, or matching, the verb to the subject noun (the person, place or thing doing the action). 1. Take off the -ir ending. 2. Add one of these 6 endings: o, es, e, imos, ís, en. Notice that 4 out of the 6 endings are the same in -ir and -er verbs. The only 2 that are different are the 4th and 5th (nosotros and vosotros forms). Watch the video on common -ir verbs and the 6 -ir verb endings. Quiz yourself on -ir verb conjugations.